Ofcourse, being a Himalayan destination, Tibet offers real good adventure oppurtunites for all those who seek to explore the lesser known places in the world. Just like the cold desert of India, Ladakh, Tibet is full of excellent trekking areas, which also provide the explorers a chance to sightsee tha Buddhist monasteries and sites too and get a glimpse inside the cultural heriatge. 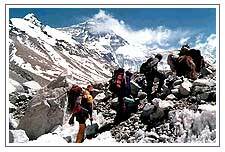 You can also go for Jeep safari trip or mountaineering towards the Tibetan side of the Everest.